Quaint and walkable Carmel-by-the-Sea is packed with chic shops, trendy restaurants and stylish wine tasting rooms — it’s been a romantic adult getaway for decades. 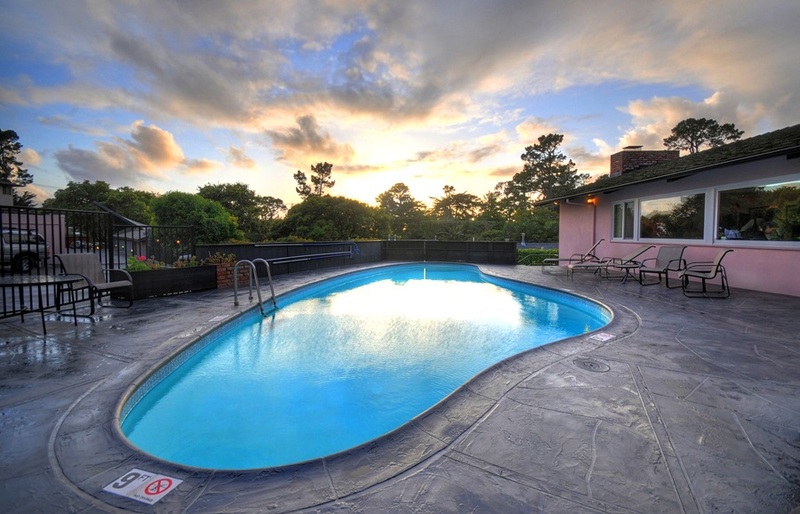 But it’s also the perfect romantic family place to headquarter with your children if you know where to stay. 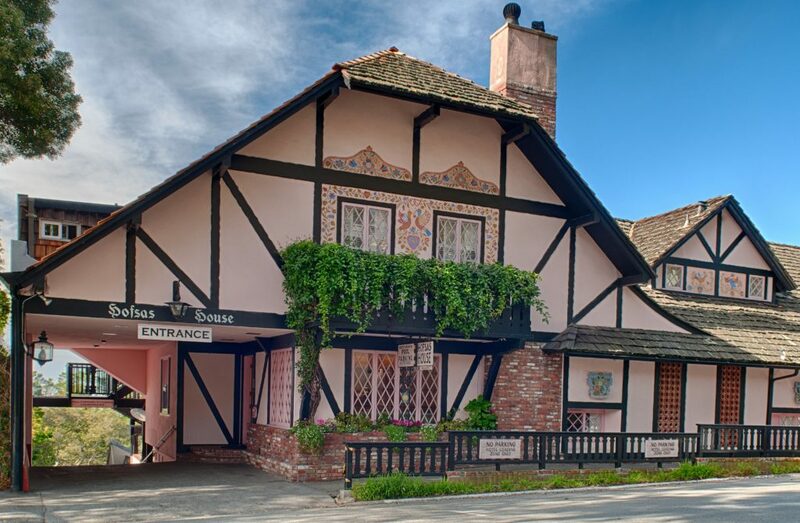 The Hofsas House in Carmel-by-the-Sea wears its Bavarian style proudly. The Bavarian-style Hofsas House Hotel has been accommodating families and their pets for more than 60 years – I remember staying there as a child and being enchanted by its old-world storybook charm. The place still has a delicious pink exterior and a life-size mural of lederhosen and dirndl-skirt clad revelers by Depression-era muralist Maxine Albro, one of America’s leading female artists of the era. Larger families will want a two-bedroom suite, which offers plenty of room to spread out and a mini kitchen for snacks. Chances are the town’s clothing shops and art galleries won’t impress your kids, but they’ll love exploring the village’s nooks and crannies, little courtyards and gabled houses that are right out of a children’s fairytale. An adorable children’s library and colorful toy store, Thinker Toys, are also worth a stop. When we visited as children, we always started our vacation at the Carmel Bakery with a gigantic soft pretzel — the bakery has been in the same location since 1906 and the pretzels are just as soft and plush as I remember them. If you visit Carmel in the summer, the open-air Forest Theater, presided over by towering pine trees, puts on a family musical every year — in 2018 it’s “The Little Mermaid.” Established in 1920, the theater also shows family-appropriate films in the spring and summer. Carmel Beach is at the end of Carmel’s main shopping street, where you can swim or play in the soft white sand or explore the tidepools and enjoy a picnic. Stop in at 5th Street Deli across from the Hofsas House to pick up sandwiches and all kinds of interesting salads and side dishes before you walk the few blocks to the beach. This area is most famous for the spectacular Monterey Bay Aquarium, a 15-minute drive from Carmel-by-the-Sea and, after spending an afternoon ogling eels, otters, sea turtles and giant fish, the Hofsas House’s heated swimming pool (one of the only hotel pools in Carmel village) lets your kids blow off steam in their own tank of water. Heated pool at the Hofsas House in Carmel. Other family-friendly activities include hiking at Point Lobos Reserve, touring the Carmel Mission, and playing at Dennis the Menace Park, an unusual playground funded by the comic artist who created the character. The beauty of staying in Carmel is walking everywhere, and plenty of restaurants like Dametra Café and La Bicyclette have menus that appeal to kids. But for an unusual experience, we headed out in our car to sample some authentic Swiss fondue at Lugano Swiss Bistro a few miles away. We ordered the classic cheese fondue – chunks of crusty bread and healthy florets of broccoli and cauliflower that we dunked in a not-too-strong cheese, and a seafood fondue with shrimp, scallops and fish that we speared on special forks and cooked in bubbling broth. It made for an entertaining, delicious and, yes, romantic evening. When the birthday girl at table next to us ordered dessert, a four-foot-tall, red papier-mache Swiss cow was carried over for her to kiss — a whimsical ending to our few days in an old-fashioned town.